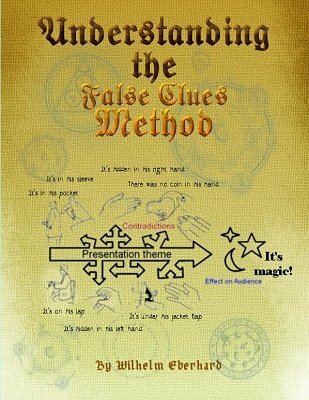 Tamariz' False Clues method helps professional magicians to eliminate contradictions from their acts, guaranteeing they produce the effect they really want on their audiences. This ebook explains the method, helps you avoid common errors and provides an overview of the fundamental theoretical concepts you need to correctly use every aspect of it. Is it difficult to use the False Clues method? Sleights and techniques are not your "talents"
1st edition 2014, 37 pages. The content of this small manuscript is certainly worthy of review. It provides a nice overall review for those that have read The Magic Way, Our Magic, Magic & Showmanship and Showmanship for Magicians. The focus is of course on the Tamariz Eliminating False Solutions method. Other principles are briefly reviewed from the above mentioned books to support this method. My criticisms of the manuscript are that the author seems to have a bit of disconnect between the topics that are briefly reviewed and the writing has some descriptive flaws (may be translation errors). Ironically, eliminating contradictions in performance and effect design are preached in the text but some of the examples contain these same contradictions. Intellectual and knowledgeable readers will find themselves mildly distracted by a few of the things the author states as fact. Overlooking the above issues, I’d still say that this manuscript succeeds in teaching the concept it was written to teach. I also recommend anyone serious about their magic be familiar with the content. I’d like to say that reading the original source (The Magic Way, Tamariz) will make this manuscript unnecessary however, the aforementioned book, although wonderful, was also translated to English and has its own shortcomings when it comes to teaching the details of applying the concept to existing presentations (I have not read the new edition that was edited). There are also points added in the explanations that are not addressed in the original source. A lot of this relates to how your character and presentation fit into the False solutions method. So the bottom line: This e-book is another resource to think about the application of a powerful technique developed by one of the shining intellects of the magic world. It is well worth studying and also as a review for the magician familiar with the method. Sometimes it helps just having it explained to you in a different way. It will hopefully stimulate the thinking of those that may benefit from a refresher course.